A few years back a world without Quicken as the mainstay of personal finance apps would have been unimaginable. It was the go to application for managing personal finances on your Mac. Now it’s hard to imagine that world without IGG Software’s iBank 5. iBank 5 is a best of class app that continues to add features and value and which should be your personal finance app of choice. How easy is it to get iBank 5 up and running and so you can start tracking your current financial status? Let’s put it this way; I had 11 bank accounts and an investment account set up and all transactions imported in less time than it took to boil a pot of coffee water and steep a press pot. This is in large part because of an an optional IGG Software subscription service called Direct Access ($5 per month, $13 per quarter, or $40 per year), which connects directly to your banking institutions using your authentication information and downloads transactions directly into iBank 5. If you prefer a more traditional method or prefer not to have an app access your banking data, iBank also offers options for manually entering your banking data or importing the Quicken or Microsoft Money files you can download from your bank. iBank also offers tools for easily migrating your data from other financial management tools such as Microsoft Money and Quicken. iBank 5 offers quick and comprehensive access to all your financial information. Once your data is imported you do have to go about the business of matching your transaction data to expense categories. Fortunately iBank is a pretty quick study, capable of matching future transactions from the same vendors to the categories you originally mapped them to. If the default set of categories the app provides don’t suit your needs or are not as expansive as you need them to be, the Categories tool appearing in iBank’s library list lets you make quick work of adding, removing or updating categories. iBank 5 organizes your banking data in a way that makes it easy for you to quickly assess your current balances. 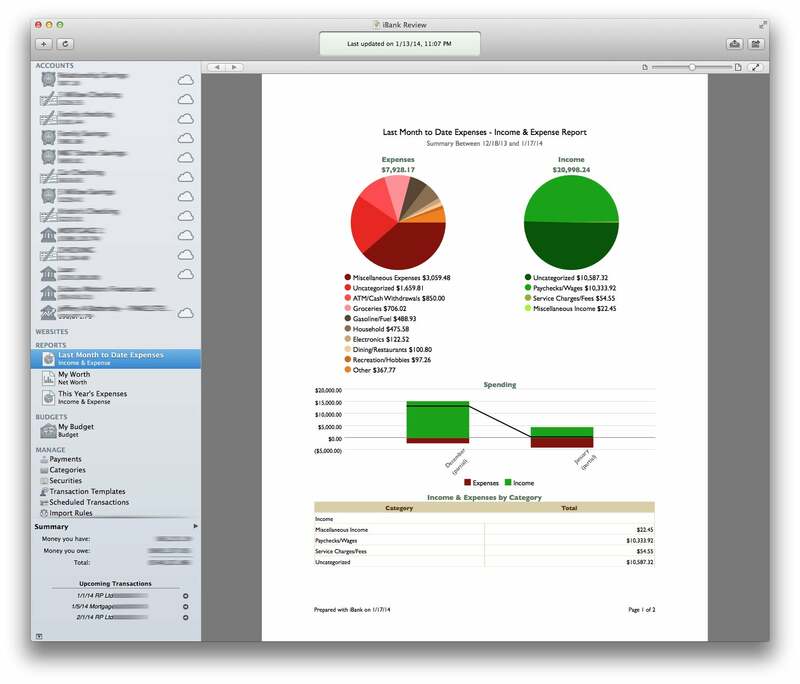 A Library list at the left of the app’s main window shows a list of your accounts, provides a basic set of reports, and tools for creating budgets. Items within iBank 5’s groupings can be dragged and reorganized in a way that makes sense to you. If you prefer an uncluttered look, any of the items appearing in the Library list can be hidden or revealed with the click of a button. A summary displaying how much money you have and how much you owe appears at the bottom of the list. You have the option of selecting the accounts that are included in this summary. So, for example, if you share an account with someone but don’t want the money in that account to be included in your total net worth, you can easily exclude it. Transactions appear in a ledger to the right of the Library list. Each transaction that appears in the list and for which you’ve supplied a category displays a small image representing the type of transaction you’re looking at. So a grocery purchase has a small grocery basket next to it and a gasoline purchase has an image of a fuel dispenser next to it. These images can be customized to your liking, but the reality is that they offer little in the way of real value. They’re just a kitschy addition to the app. iBank 5 ships with several standard reports each of which gives a graphical overview of where you’ve spent your money. The app’s basic offering include income and expense reports for the last month, last year, and current year as well as a net worth report. The app’s existing reports can be customized to suit your specific needs or you can create your own reports by choosing the Add New Report option from the Tools menu. iBank 5 provides 10 starting points for reports, including Portfolio Summary, Category Detail, and Forecast reports. Once selected these accounts can be customized to include specific accounts and categories. The app’s budgeting tools offer both the traditional budgeting method of making “guesstimates” of how much you hope to spend each month and comparing your actual estimate to that budgeted amount or the truly old-school method of envelope budgeting, which pre-allocates funds to specific budget categories from which you can then “draw” funds for payment in those categories. iBank 5’s budgeting tool walks you through a brief questionnaire about scheduled and unscheduled transactions, how much income you expect to see each month and where you expect to spend your money. I found the budgeting tools to be excellent and, if you choose to use the envelope method, simple, when necessary, to pull money from one envelope so you can put it another. iBank offers a number of ways to make it easy to stay on top of your bills and to get them paid. Scheduled transactions automatically appear in the Calendar app. If your bank account is setup to use bill pay features you can use iBank 5 to pay your bills, with the added benefit that iBank 5 will first check to make sure that the transaction will not cause an overdraft. iBank 5 is an excellent personal finance application that makes it effortless to track your financial transactions, stock portfolios, as well as create budgets and reports to help you assess your current and future financial status. There is no better financial app available today for your Mac. If you're looking for a Mac app to keep track of you finances, there's really nothing better than iBank 5.